Raise more at your event with MobileCause. Request a Demo! Stretched thin on resources yet still need to put on a wildly successful fundraising event? MobileCause is the answer! MobileCause simplifies your efforts and amplifies results by tackling many of the pain points your staff and guests experience before, during and after an event. Get everything you need to invite, manage and cultivate donors for any fundraising event in one simple software solution. Raise more money easily and efficiently with MobileCause event fundraising software. Request a free demo today! *MobileCause event fundraising software is only available to tax-exempt organizations. 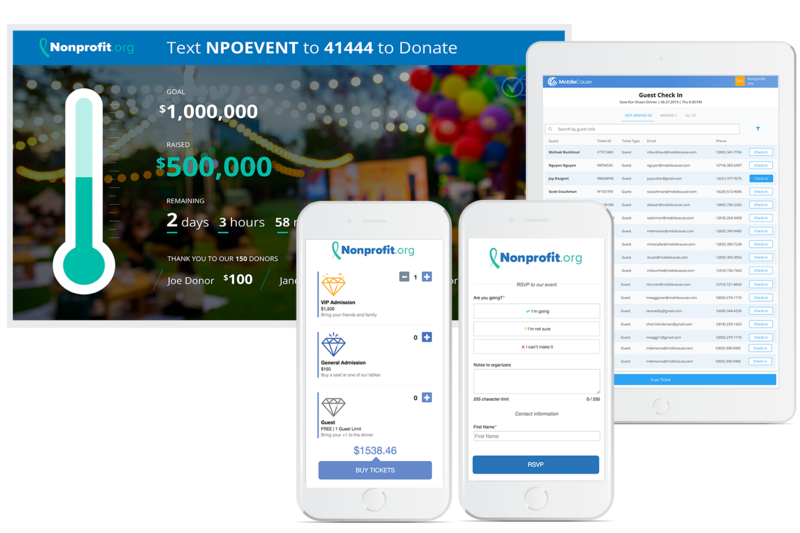 With MobileCause online and event fundraising software, you can say ‘hello’ to organization and ‘goodbye’ to useless disarray by benefiting from consistent donor records, integrated CRM reporting and all of your fundraising tools in one efficient place. We believe 100% of donations should go directly to your cause, so you will never be charged any transaction fees.